Benefits: Dietary support may be needed to protect you against resistant strains of microorganisms. This product is designed for adults and children who are unable to swallow Olive Leaf Extract capsules, or just prefer the convenience, ease and taste of the liquid. 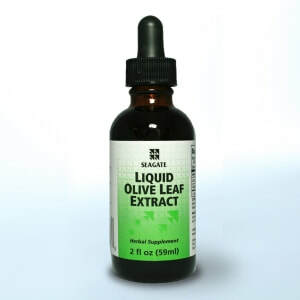 One full dropper (1 ml) contains the equivalent of 250 mg. of Olive Leaf Extract in powder form. Directions: Shake well before using. If the dropper comes into contact with your mouth, wash off the dropper before resealing the bottle. This bottle should not be shared with others. This product is flavored with natural raspberry-spearmint, similar to the Seagate Olive Leaf Throat Spray, giving it a pleasant taste. It can be taken directly from the dropper, without diluting it with water. Oleuropein fact and fiction: The olive tree is a very resistant plant (Olea europaea) which has survived over 10,000 years almost unchanged because it has developed a specific mix of phytochemicals to protect itself from attack by fungus, insects, bacteria, and disease. Seagate Olive Leaf Extract is a whole herb extract concentrating all of the valuable phytonutrients from the olive leaf, rather than trying to concentrate one single chemical. There are 7 important phytochemicals - caffeic acid, verbascoside, luteolin 7-O-glucoside, rutin, apigenin 7-O-glucoside, luteolin 4’-O-glucoside and oleuropein -- that contribute to the benefits available from this extract. Side-effects: Olives, olive leaves and olive leaf extract have been part of our food chain for thousands of years. Therefore olive leaf extract will not kill off the beneficial bacteria lining the stomach and intestines. This is a natural plant product, not a drug. Seagate has been producing Olive Leaf Extract in capsules since 1997. The only 2 side effects that we have noted in all these years are: a) the occasional mild reaction for people who are allergic to olives; and b) the Herxheimer reaction, which is caused by the rapid die-off of fungi that may release mycotoxins into your system causing an allergy-like response. Both of these reactions are very rare. Suggested Use: Use 1 full dropper (30 drops) 2-3X/day.